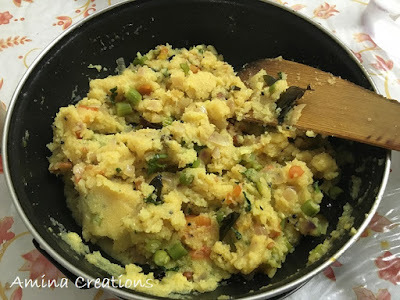 Rava upma is a quick and easy to make breakfast dish. But most often children do not touch it as it looks bland. To make the dish more interesting, we can veggies into it. This not only adds colour to the dish but also makes it more healthy and flavourful. Heat oil or ghee in a pan, add mustard seeds and allow the seeds to sputter. Now add the vegetables and saute for a few minutes till they are cooked. Next add dry red chillies, curry leaves, turmeric powder and asafoetida and mix well. When it starts boiling, reduce heat and add the semolina slowly, while stirring continuously. Make sure that there are no lumps. Continue cooking and stirring for a couple of minutes till most of the water has evaporated and large boils are seen.